Our next stop takes us to Truth or Consequences (commonly knows as “T or C”) – a small town with a funny name and an interesting history. Formerly known as Hot Springs, New Mexico, Truth or Consequences received a name change in 1950 after winning a nationwide contest hosted by the radio game show of the same name. Its former name describes what the town is best known for – its abundant local hot springs and spas. But we weren’t just there to soak and relax (though we did do some of that too), “T or C” is home to an interesting artist residency called Starry Night Retreat. Founded by artist and entrepreneur Monika Proffitt in 2011, Starry Night is a residency program offering artists, of all different kinds of mediums, a choice of 1-8 weeks in a furnished apartment near the heart of the small town. This was definitely the priciest residency we have visited at $900 a week, but there are some options for payment plans and work / trade if an artist really wants to pursue this opportunity. Starry Night Programs also offers online classes for artists to develop professional skills as well as a program connecting artists to Art Basel Miami. That evening we went to Sean Hudson’s closing MFA show at Small Engine Gallery and met a bunch of cool artists, a couple of whom had some interesting small world connections! We stayed the night with artist and friend Abigail (Bagel) McNamara. On our way north to the next residency, we made a necessary stop at a place we had been hearing a lot about throughout the trip: Meow Wolf in Santa Fe. Expecting a somewhat traditional gallery with installations, we were really thrown off guard (in the best way possible) when we stepped inside the former bowling alley, now converted into a fully immersive, imaginative, and interactive exhibit by the art collective Meow Wolf. Equal parts Pee-Wee’s Playhouse, Alice in Wonderland and Netflix’s Stranger Things, “House of Eternal Returns” can’t even really be described in words. It’s just something you have to go see. And we highly suggest paying $1 for the Chromadepth Glasses. Next stop: The small community of Lama, about 20 miles north of Taos, is home to the next residency, HEREKEKE. 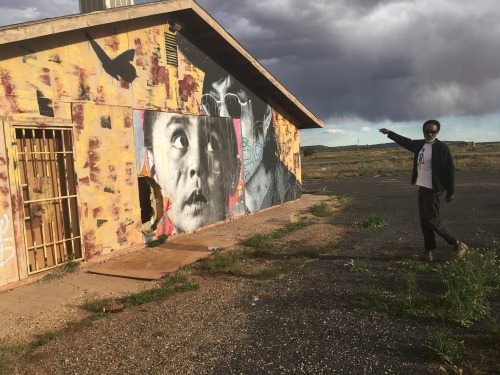 On a ranch, overlooking the magical and dramatic landscape of the Rio Grande river valley at 8,200 feet, HEREKEKE welcomes artists in all stages of their career and offers various programs. We talked to two of the founders, two incredible woman with a very similar beginning to us: Peggy Chung and Liliana Mejia met at an artist residency and it changed both their lives in important ways. “I’ve always felt like the biggest artwork you can create is your life,” said Peggy as we toured the studio, the sunlight pouring in through the large windows Artist residencies are from two to six weeks and artists work in a self-directed manner amongst the mountains and expansive landscape. Peggy, Liliana and other founder Nat Wilson, are interested in building relationships with the community and creative sustainable practices, offering music lessons, youth classes and other community resources like hosting a neighborhood goat milking cooperative. We love what they do! 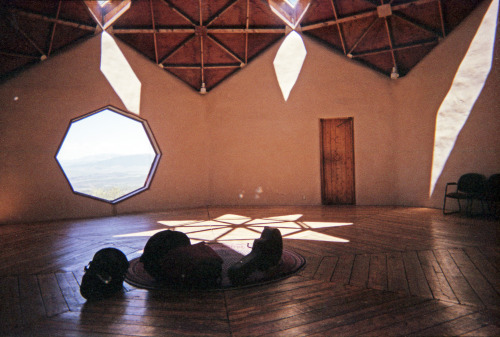 During our time on Lama Mountain, we also had the incredible privilege of touring and spending time at the Lama Foundation: a spiritual community and retreat center that opens to the public once a year for tours, lunch, meditation and dancing. nd then began the much anticipated drive to Paonia, Colorado – the place where we first met. Summer of 2013, we both began our first artist residencies at Elsewhere Studios. Due to a scheduling mishap we ended up being there at the same time. It felt almost fated: Elsewhere helped facilitate necessary shifts and changes in not only our artistic practice but our personal lives. After our residency period, Alicia ended up leaving New York, where she was living at the time, and moved to San Francisco with Carolina. Originally from the Bay Area, this transition was much needed and we were roommates and collaborators from then on. We returned to Elsewhere the following year as a collaborative team and further solidified the connection we have to the residency program, the land and community here in the North Fork Valley. (It continues: In late September, I (Carolina) moved to Paonia to be the Residency Program Manager of Elsewhere. Life moves full circle sometimes!) Elsewhere welcomes residents from all over the world at any stage of their artistic career for a 1-6 month residency in the unique and supportive environment that is Paonia. It’s very exciting to live here and work at the place where Piney basically began. I can’t wait to get to know all the residents that come through, and for Alicia to visit! After catching up with friends in Paonia and visiting our old stomping grounds such as the local brewery, we head to eastern Colorado to a little rural town called Byers. Here we are meeting with Richard Saxton and Mary Rothlisberger of M12 and Rural Environments Field School. In Byers, we pull up to “The Feed Store”: once a bank, post office, grocery store, and ranch supply store, it served as the M12 office, studio, workshop, and an experimental space for rural cultural activities, which is now being moved to another location in the West. M12 is an interdisciplinary artist collective with an ever-evolving group of people creating projects based on the aesthetics of rural culture and landscape. At The Feed Store, we are greeted by college students who are part of the Field School. 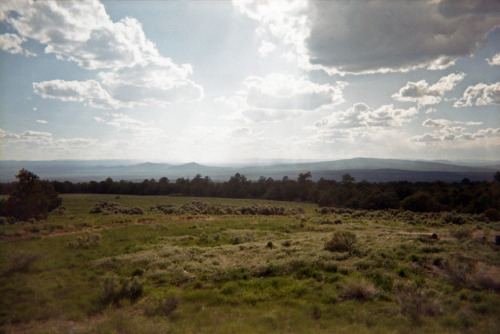 Connected with the University of Colorado - Boulder, the Field School is an intensive off-campus college course in which students are placed into rural environments in order to facilitate context-based approaches to creating art. We are there as visiting artists, speakers and curators and soon we are put to work, curating the students’ final show. The show is the culminating event after the course, and is a night of art, food and conversations. From Byers, we drive west to Utah! Our next stop is in Green River, Utah, home to a very interesting and important project called Epicenter. We meet Maria Sykes, Chris Lezama, and Jack Forinash who helped found the non-profit in 2009. The town of Green River, with its red cliffs and blue skies, has a population less than 1,000 and is located approximately 100 miles away on either side from Grand Junction, Colorado and Richfield, Utah. This means that the town’s main economy is to serve drivers on I-70 needing motels, gas and food. Epicenter is an organization of people working towards creating a positive impact by partnering with local businesses to help boost the economy, bringing visiting artists to work on community projects as well as designing affordable housing for residents. As a part of their residency program, the Frontier Fellowship, they bring artists and designers to Green River for four weeks to create community engaged works that help instill rural pride. On our drive to the next residency we stop in Ephraim, Utah – a small town that Maria told us was the home of the Granary Art Center. The historical building is used as an exhibition and educational space showcasing local and international artists. Maybe home to a future residency? We spent one night at Birch Creek Service Ranch near Spring City, Utah where Adam Bateman of CUAC (Central Utah Art Center) had some residency space along with a now-closed gallery in Salt Lake City. The residency is in a transformative phase so stayed tuned! While we were there, though, it was buzzing with activity as young camp counselors were getting ready for the yearly summer camp. At other times of the year, the ranch hosts artists who make use of the land, home to a large workshop and a two-story main building made of straw bale. After sleeping under the stars at Birch Creek Service Ranch, we head to Nevada! But right before we enter Nevada, we stop at CLUI – Center for Land Use Interpretation in Wendover, Utah. It is located in a former airbase and consists of a public display of an informational interpretive art exhibit. We leave our car in the small town of Montello, Nevada, and hop into Stefan Hagen’s– the founder of Montello Foundation– big rental car to embark on a harrowing journey down a bumpy, rural road to the most secluded residency we’ve visited yet. The building houses studio and living space and sits on 80 acres of land surrounded by expansive views of an untouched valley, the nearest house being 16 miles away. There is no staff, no other artists, just you, your thoughts…and certain wildlife, of course. Artists are invited to stay for two weeks in this breathtaking desert landscape in order to really focus … or to get distracted by the clouds. While we were there we met artist Micol Hebron (and her dog, Klaus) and had an incredible time exploring the land, watching the sunset and sharing meals. At this point, our trip is pretty much at a close and we are feeling a combination of feelings. Mostly we feel a sense of sadness that this incredible journey, with it’s stunning landscapes and unique, inspiring people we met along the way, is almost over. But! We have one last stop with an amazing artist friend, Sarah Lillegard, in Reno. Sarah is a maker of things and focuses on the intersections of personal mythology and the American West. She is also a student at Sierra Nevada College in their MFA in Interdisciplinary Arts Program, the same program that gave us the Lupita’s Grant that helped make this trip happen. We have a million thanks to give and so grateful for every experience. We will be hard at work compiling everything we learned during our tour in order to print our second publication early next year. But we’ll keep updating you along the way! In the morning, we planned to go southeast into Arizona to visit Kingman Arthub. First though, a stop in Las Vegas was essential, the lights and spectacle of the Strip a must-see. 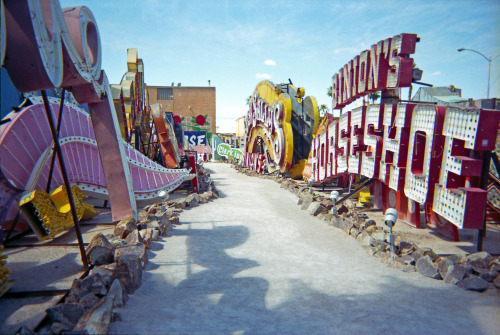 We had also heard about a neon sign boneyard: The Neon Museum features signs from old casinos and businesses that are on display outdoors and some are slowly being restored. Visitors can take a tour and admire the artistry that went into each sign while learning the significant history of a different era in Las Vegas. In Kingman, we met director and artist Janie Stapleton and current artist-in-residence, Henry Kunkel. Kingman Arthub, on the corner of the main street in the historic downtown, serves as a community center for locals as well as a free three-month residency space for artists from all over the world. The Arthub was created in order to benefit the Kingman community with workshops, lectures and open studios. After a much needed yoga session at a studio a couple doors down from the residency, we headed to Kingman’s brewery to unwind, learn about the residency’s history and meet some locals. As we sipped on our local brews, the conversations ranged from art, thrifting, punk shows and philosophy …we instantly felt at home. The next morning we hopped around thrift stores and then sadly made our goodbyes to our newfound Kingman friends. We wove our way north to Utah, heading to a magical campground we visited a couple years ago. 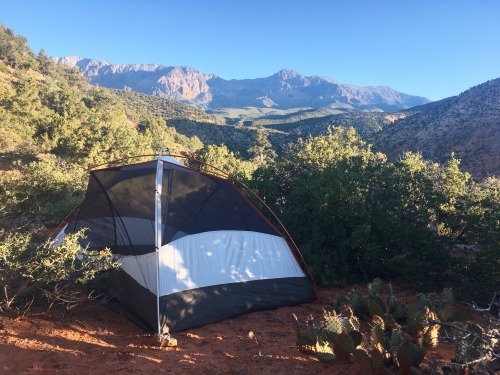 Free BLM camping can be found right outside historical ghost town Silver Reef, only 45 minutes west of Zion National Park. The surrounding landscapes range from woodlands to rugged red cliffs. We spent the morning scrambling the slick rock and feeling rejuvenated by the desert landscape. We were so excited about our next residency stop: Zion National Park! Arts involvement within the National Parks date back to the 19th century and some parks continue that tradition by integrating artist residency programs. Eleanor Siebers, Volunteer Program Manager, gave us a special parking pass to drive into normally restricted areas of the park, which was very thrilling to us! She lead us to the Grotto House, a historical cabin for the artist-in-residence as well as the occasional researcher. Each year, four artists are chosen to spend a month living amongst the awe-inspiring canyons of Zion. We spent our time hiking, exploring, and BBQing. At night our only companions were the animals, canyons and stars. This experienced was unmatched… we felt like the queens of Zion. After a couple days of being in nature with no technology and no driving, we felt clear and refreshed as we piled our belongings back into the car and headed to our next residency. Back in Arizona, the Navajo Nation is home to the Painted Desert Project. Chip Thomas, doctor, activist and public artist has lived on the reservation for about 30 years and invites artists from all over the world. Artists create public art in order to collaborate with and contribute to the surrounding community. Chip was incredibly inspiring with his passion, stories and amazing book, record and art collection. The next day was our longest driving day, but the end was well worth it. We were meeting with friends in Taos, New Mexico, where they host locally foraged, wild plant-based dinners as part of a series called / Shed Project. These small-scale dinners are served on handmade native clay ceramics or found natural objects. The experience was thoughtfully cooked and curated by Johnny Ortiz and Leia Layus, who had a story to tell about each course. Our next stop was a small railroad town in South Central New Mexico, with a population less than 1,000. The town of Carrizozo is home to MoMAZoZO and Carrizozo Colony AIR. We met with Paula Wilson and Mike Lagg (and their dog, Duchess) at the historic movie theater that they are slowly renovating, along with a former hotel and brewery, into living and working artist spaces.The free residency space invites artists of all different mediums — using a very broad definition of “artist”— and offers solitary time for the artists as well as a welcoming community to interact with. We stayed with Mike and Paula in their wonderful home - Mike is a woodworker and has built creative structures and sculptures in the backyard while Paula, a cross-media artist, has painted murals covering every wall of their home, inside and out. We really fell in love with the magic of Carrizozo, Mike, Paula, and Duchess, and can’t wait to return! Next time: There are still two more residencies in New Mexico to visit, and then we return to where we first met, Elsewhere Studios in Paonia, Colorado. This is a video Alicia took while BBQ-ing at our new home, The Grotto House, in Zion National Park. We’ve decided to post this as a serial because there’s so much to tell! Four weeks, six states, sixteen artist residencies and countless inspiring people and experiences made up the Southwest tour. The desert’s magic and warmth really resonated with us, as well as the people who live there, and the drive back home was a reluctant one. Every space was unique and we are so excited about all of them. A question asked a lot is, “Which residency has been your favorite so far?” And we can say with the utmost sincerity that every single residency has been our favorite. And so begins our second trip. After another great fundraiser party (thank you again to everyone who participated and came to the event!) and a dreamy day of sailing around the bay with collaborator and friend, Kelly Gregory, we packed, re-packed and set off in Alicia’s trusty Subaru, Stella. Stella weaved us in and out of red rock canyons, expansive desert landscapes and mountainous terrains through California to Nevada, Arizona, New Mexico, Colorado and Utah. First stop: L.A. where we spent time with artist and old friend, Britt Acocelli and visited Women’s Center for Creative Work. We met with Managing Director Sarah Williams. Sitting by the L.A River on a bright afternoon, we talked about the mission and structure of the not-for-profit creative space. 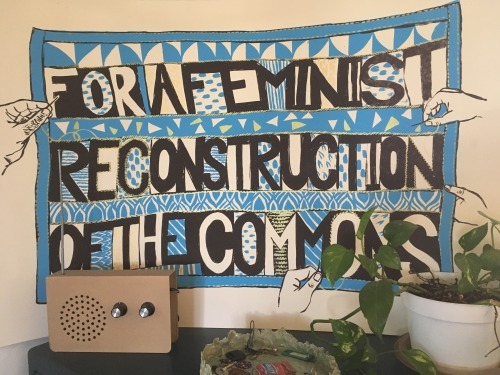 WCCW, founded in 2013, is a co-workspace that facilitates projects cultivating feminist creative communities and practices in L.A. WCCW houses the Feminist Library on Wheels (F.L.O.W. ), has residency programs and expansive resources including a full calendar of community events. A group of women who are doing really cool, important things! While in L.A., the Museum of Jurassic Technology was on our list of places to visit and it did not disappoint. It’s unlike any museum you’ve ever been to. Through maze-like rooms that just seem to keep expanding there is a wonderful emporium of magical objects, curiosities and oddities. Ending with tea and cookies on a sunny rooftop, doves cooing and flying around, you feel as if you traveled to another country, time, or reality and completely forget about actually being on bustling Venice Boulevard. Still in a magical haze from the Museum, we head to Escondido, 30 miles Northeast from San Diego, to meet with RJ Brooks - co-founder of Ship in the Woods (or WSOHOIDPS). It was RJ’s birthday and the house was bustling with activity and celebration when we arrived. Ship in the Woods is a volunteer-run space that has a residency program, houses interdisciplinary projects and creative events such as performances and interactive installations. During our stay, we got to test out the Rhodopsin project where the audience sitting in complete darkness, gets exposed to a bright flash of light, creating a clear after image almost like a photograph in your retina. This collaborative project between Ship in the Woods, a neurobiologist and sound artist is just one example of how the space combines art, science and new media. Warner Springs was our next destination to meet with Nina Karavasiles – co-founder of potential residency space called Just Shift. Partner Julie McConnell and Nina have come up with plans for a short-term residency that focuses on environmental stewardship and education. We toured the grounds and spoke to Nina about her vision for the program’s future. There is a lot of potential for Just Shift and we are excited to see what they have in store! We made a necessary stop at Salvation Mountain and The Salton Sea, both unique and fascinating places. At Bombay Beach we stopped for a beer and grilled cheese at Ski Inn, where we played music on the jukebox and talked about The Beach Boys with the chatty bartender. Most of the bar’s surface is covered in signed dollar bill signs (look for Piney’s when you’re there!) After our dinner, right at sunset, we ran along the fishbone-crusted beach of Salton Sea, the smell of decaying fish filling the air. Our first camping night was spent right outside of Joshua Tree National Park and the next morning we went hiking and exploring through the park. Desert flora, spiky otherworldly trees and impressive rock formations creates a surreal landscape. After a couple of hours of scrambling up and down rocks we arrived to the fun and unique town of Joshua Tree. We browse through some thrift stores and find ourselves at a really unique arts compound run by Shari Elf, where there is awesome silkscreened art and Carolina drooled over the World Famous Crochet Museum. We then made our way to Joshua Tree Highlands Artist Residency. JTHAR is a residency program adjacent to the National Park where artists can live in one of the five homes located on five acres of inspiring land. Amongst scurrying lizards, desert wildflowers and panoramic mountain views, residents can work undisturbed on their projects. When we entered the 900-sq-ft studio with large windows overlooking this unique high desert terrain, we both instantly felt creative and inspired. Near the eastern edge of Death Valley National Park, in southern Nevada, is the ghost town of Rhyolite. This was our next destination to find Goldwell Open Air Museum and talk to Richard Stephens, the President of the museum. Richard told us about the history of the residency program and the town, played a beautifully eerie song on a flute he made, and shared some really incredible stories with us. The museum began in 1984 by Belgian artist Albert Szukalski who felt the expansive Amargosa Desert was evocative of the “holy land” and created a giant ghostly “Last Supper” installation. Continuing with Albert’s artistic exploration of the land, Goldwell offers residency and workspace programs for artists. At this point on our trip, we are already feeling entranced by the land and energized by all the stories we are hearing … But there are still 11 more residencies left to go! Stay tuned for the next post where we talk about more artist spaces, camping / hiking, and meeting new and old friends throughout the Southwest.